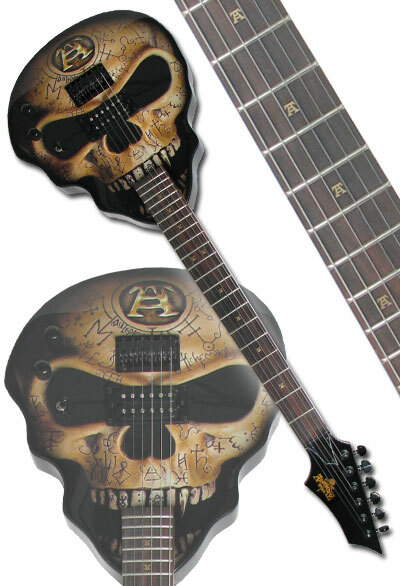 Limited edition guitar produced by "Hot Picks USA" incorporating Alchemy Gothic artwork. Features include: Solid Mahogany Body; Upgraded Sealed Tuners; High Output Pickup; Heavy Duty Tailpiece; Alchemy Logo Inlays; Maple Neck; Rosewood Fingerboard; 2 Position Coil Tap; Jumbo Frets; Limited Edition (Serialized). Product features Alchemy Gothic artwork and is produced by "Hot Picks USA" under license from the Alchemy Carta Ltd. England.